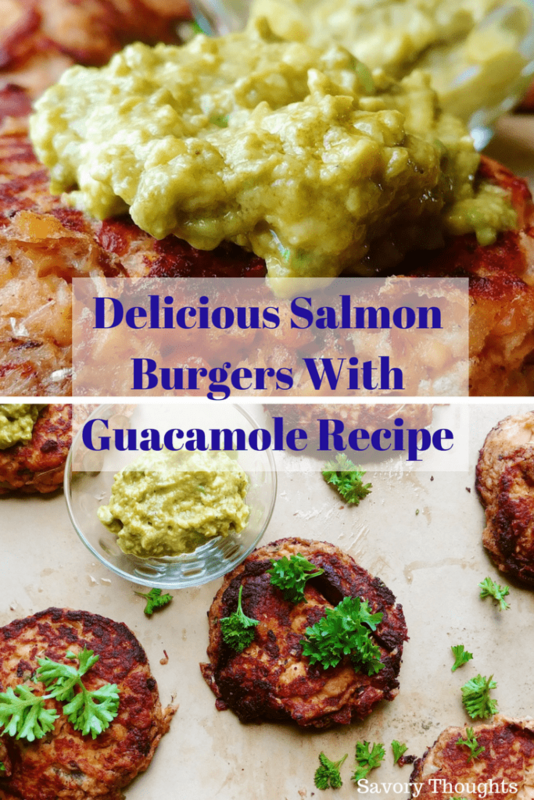 Salmon Burgers – If you are a salmon lover, you will love these Delicious Salmon Burgers With Guacamole Recipe. They are tasty, perfectly golden and flaky on the inside. Friends, these salmon burgers are perfect enough to eat on their own. Although…. you might want to make the guacamole to go with them. Just saying. I’m talking about flavors that will explode in your mouth. Pure goodness! The salmon patties are easy to make with little effort and are perfect for a quick easy dinner. Well served with the bun of your choice. 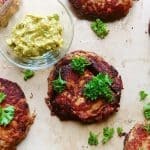 Dress up these salmon cakes with, of course, the delicious guacamole (recipe method below), lettuce or spinach, tomatoes, and onions (optional). 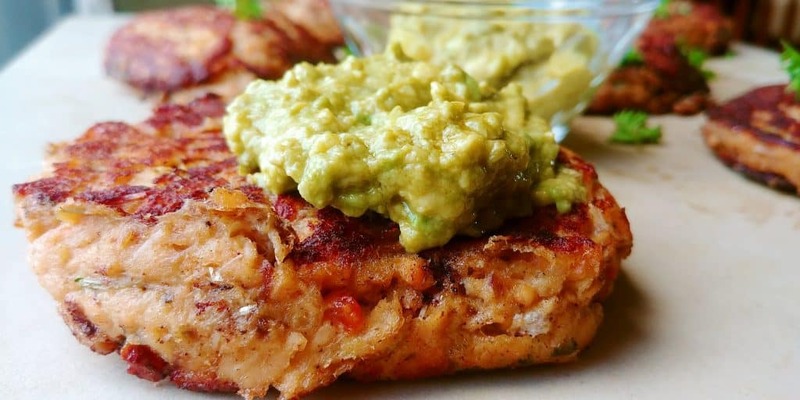 What to serve with these Delicious Salmon Burgers With Guacamole Recipe? 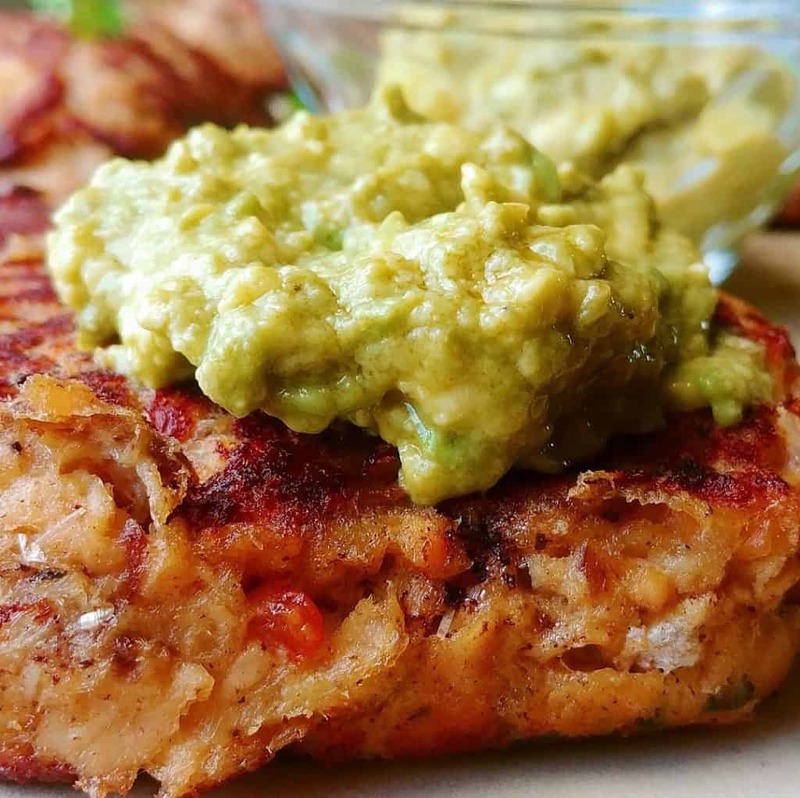 If you’re wondering what to serve with this Delicious Salmon Burgers With Guacamole Recipe, and want to skip the buns, below are some of the best healthy choices. Serve any of the choices listed above to create an enjoyable, tasty, Delicious Salmon Burgers With Guacamole meal. Truly, friends, you will want to dress the salmon burgers with this guacamole recipe. All you need to make an easy, tasty, and perfect guacamole is ripe avocados and salt. Of course, you may follow it with a little lemon or lime juice for acidity purposes. However, I like to add a little cilantro and depending on if hubby is around, I’ll add a small amount of chopped onions. Once you are done mixing the ingredients, you’ll have the perfect dressing for your salmon burger. To make these perfectly round salmon burgers, I like to use my measuring cup to help form these little guys into nice size patties. These salmon burgers are perfect enough to eat on their own. However, when dressed with the guacamole, the flavors will explode in your mouth. Perfect for a night that calls for an easy quick dinner. Now, here’s the secret to a perfect guacamole – use ripe avocados! That’s it. Period. Below are the steps to make these babies. Please enjoy! There’s a reason for everything. You must discover your own destiny. For a quick bite on the go, these salmon burgers are perfect enough to eat on their own. However, when dressed with the guacamole, the flavors will explode in your mouth. Perfect for a night that calls for an easy quick dinner. Heat a nonstick pan over medium heat. Drizzle 2 tbsp. of oil in the pan, spreading it around. Using a 1/4 measuring cup, scoop a small amount and place into the heated pan; gently pressing down the patty with a spatula. Cook for 4-5 minutes or until golden brown. Carefully flip and cook for an additional 4-5 minutes or until the other side is also golden brown. Remove from heat and place on a paper toweled plate. In a small bowl, gently smash the avocado with a fork. Then add the salt and pepper, Tabasco sauce, apple cider vinegar, and olive oil. Mix well. Serve with salmon burgers. Drizzle lemon or lime juice over the cooked salmon for enhanced flavor. hahaha oh no! not on the keyboard. Thank you, Cori. I’ve never made salmon burgers before. What a great idea! Going to try out this recipe this weekend. Hope it turns out as good as yours looks! I am pretty sure it will! Thanks for reading, Lucy! This looks so tasty and healthy too! Thanks for reading, Dani. I hope you like it. Oh my god, this looks so delicious! Salmon is my favorite but I never thought of a burger. I am definitely going to try this soon and of course with Guacamole sauce! Thanks for sharing! You definitely should try it. Thanks for reading, Pooja! im not a huge fan of burgers but salmon? i love it big time including this! it is surely something i would be interested to try! these look absolutely mouth-watering, how yum! these salmon patties look amazing. Never thought of serving it with guac!! This looks delicious! I love that you topped them with guacamole! Yum! I love salmon and what better than in a burger. I’ve just started liking salmon, this looks fantastic. I’m so excited to have another great salmon recipe. This is a new way to enjoy cooking salmon. Looks delicious and easy. Definitely trying this recipe. Thanks for this recipe!. Thank you, Arjhon. Let me know how you like it. I love salmon burgers too as they are so easy to make. Thanks, Heather! 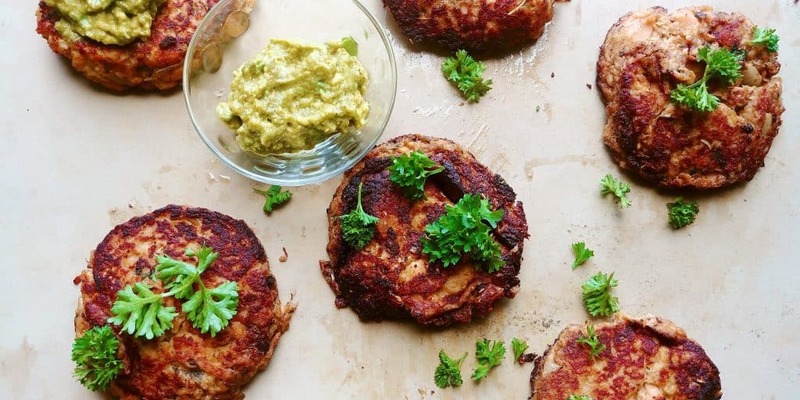 I’ve never made salmon burgers but these look delicious! Adding guacamole is such a good idea! Will totally be saving this for a weeknight meal! Love that you included options for those of us who want to skip the buns. Can’t wait to try this out. Wow! Salmon is one of my favorites! Now I have a new way of cooking it! Thanks! Definitely! It is one of my favorites too. This recipe looks delicious and also healthy, especially if we serve with some of the options you gave. And the guacamole is a nice twist, I will try to cook it some of these days. Wonderful! I am glad you find it to be helpful.